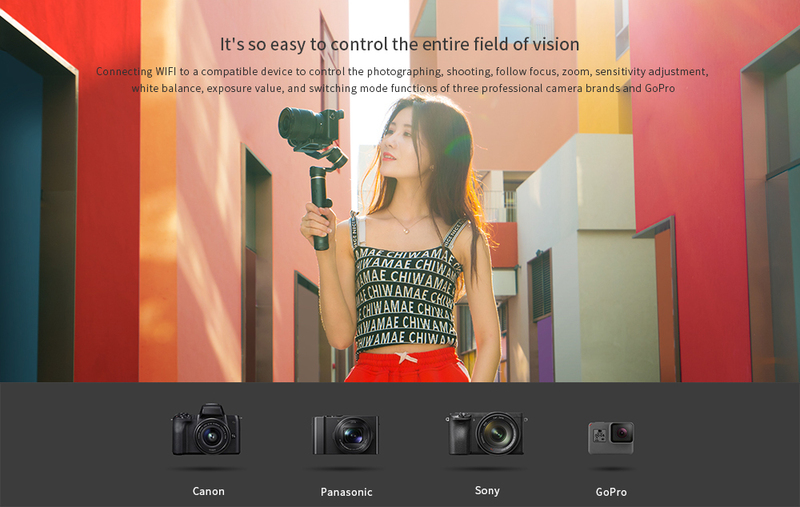 By connecting to WiFi, G6Plus can control the camera to adjust the focus, switch the shooting mode, select the resolution, etc. Shoot by a single hand, liberate one hand of you. The body comes with 1/4 inch threaded holes which are compatible with all photographic equipment accessories with 1/4 inch thread on the market. 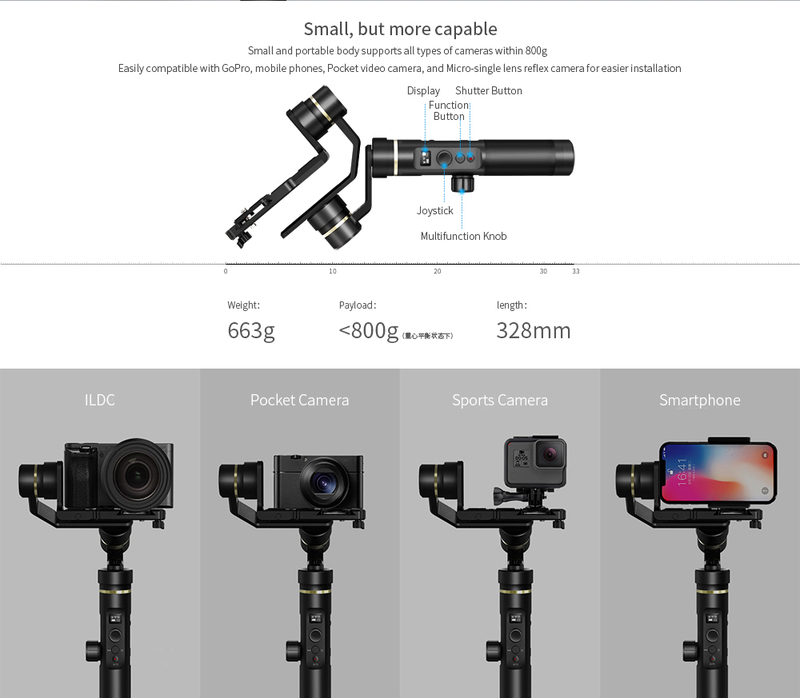 It also could be compatible with Sony RX0 and GoPro Hero series of action cameras. Fit for smartphone with smartphone adapter, the width of smartphone should be 54-87mm. 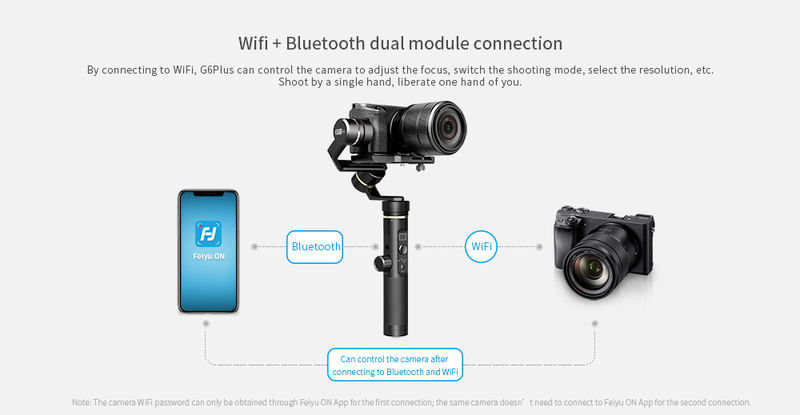 The maximum payload is 800g in the center of gravity balance, the camera height is recommended not to exceed 70mm, otherwise, the camera might hit the gimbal while it is working. Loosing the knob ring, move the cross arm to the left/right to adjusting the balance. Moving adjustment sliding plate back and forth to balance tilting axis in horizontal direction. 1. Excellent splashproof technology ,no more resistance between you and the rain. 2. Unlimited rotation of pan axis allows to take wider footage. 3. Users can accurately compose the pictures without external monitor with a 35 degree elevation angle of roll axis in design. 4. Suitable for many kinds of cameras with no need for replacing other mounting plate. 5. Original multifunction knob provide more precise control. 6. 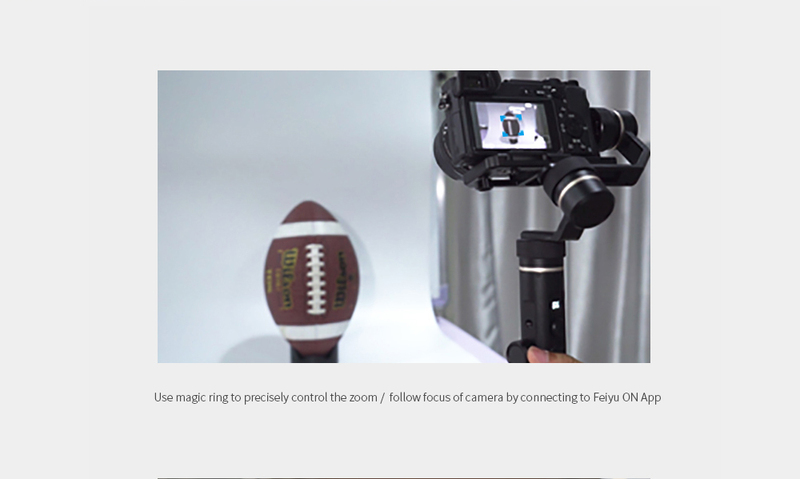 The multifunction knob realizes zoom and follow focus. 7. Anti-detachable 1/4-inch thumb screw design, which could be compatible with action camera, smartphone, digital camera and mirrorless camera. 8. Vicool and FeiyuON support bilaterally to meet your different needs. 9. It is pretty straight-forward to get information from OLED screen,such as battery indicator of the gimbal,working mode and the camera mode. 10. Change different modes of camera by one button. 11. It becomes utterly straightforward to have camera do photography. 12. Manually lock the angles of two axis without missing any splendid moments. 13. Find the unique beauty created by separate roll rotation control. 14. 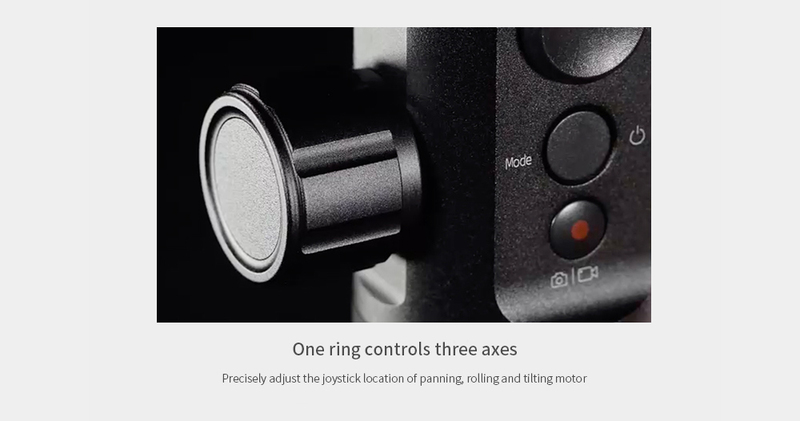 Trigger button to quickly enter lock mode and reset the gimbal. 15. Intelligent initialization to automatically check motionless desk and auto-complete. 16. Multiple working modes fit for most scene.